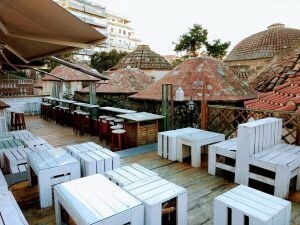 Greece’s second largest city surprises with many ancient buildings and a relaxed atmosphere. Here you will find the perfect blend of vibrant life, culture and historical heritage. The latter interests me the most. Yay! 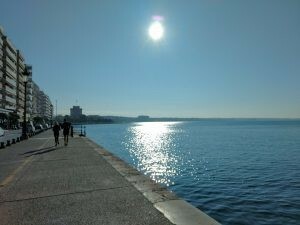 A trip to Thessaloniki is always worthwhile at any time of the year. 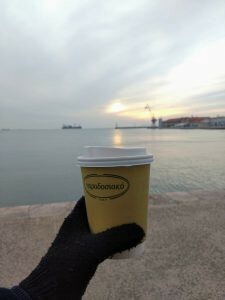 For fans of history and culture I have put together some inexpensive or even free tips for the harbour city of Thessaloniki. Btw:You can find cheap flights with my tips HERE. 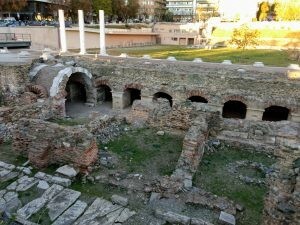 Thessaloniki has an eventful history to tell. For many centuries it belonged to the Roman Empire and was one of the favourite residences of several Roman emperors. Then it fell into the hands of the Ottoman Empire, which changed and enriched the face of the city. Due to the immigration of mainly Spanish Jews in the 15th century, it later became one of the most important Jewish settlement centres in Europe. All these influences shape the cityscape and there is a lot to discover. I had a wonderful stay here with 25€ per day for 5 days and I didn’t miss anything. 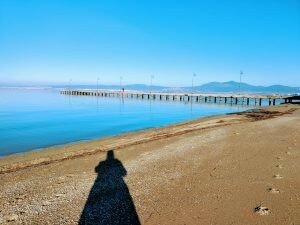 In the low season, not only the flights are cheap. Accommodation can also be booked at a very good value for money. 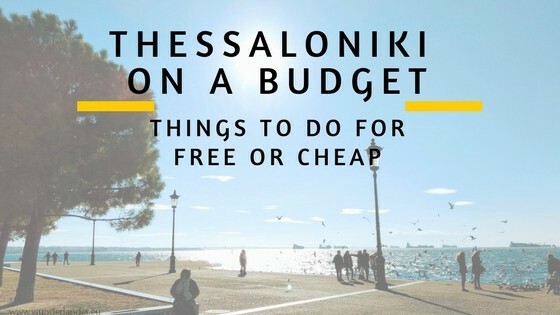 In comparison to highly commercialised cities with a high share of antiquity such as Rome or Athens, in Thessaloniki all the places to see are only a stone’s throw away from each other and are either completely free of charge or very inexpensive. 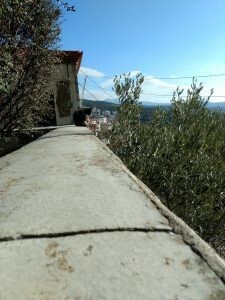 If you, like me, can’t get enough of antique statues, columns, Walking paths, old floors and crumbling walls with hardly recognizable patterns, a trip to Thessaloniki and its surroundings is exactly the right thing! 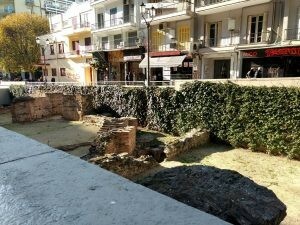 Between new buildings, shopping streets and glass facades you will find millennia-old ruins and buildings everywhere. And all this is not only free of charge, but you can also walk around between old walls and buildings without barriers, touch the old stones and be inspired. Off the peak season even almost completely alone! Alternatively, you can do it like the local youth and just sit on it and have a drink. The ancient Roman forum, discovered by chance during construction work, has a well-preserved amphitheatre and an underground tunnel system. The opening hours are approx. 10 am to 5 pm. You can also have a look at an old brothel. The finds can be admired in their entirety in their own free museum. The Forum is easily accessible on foot, north of Artistotle Square. The old Hamam (Turkish bath) dates back to the Islamic occupation of the city. An old steam bath with separate buildings for women and men with several cupolas. Today it houses a small museum with exhibitions and a wonderful bar with a terrace directly on the roofs of the flat dome buildings. Here you can enjoy a glass of wine and watch the sunset in an ancient atmosphere. I’ve never seen such a view before as an antique lover and was therefore happy to have the entire terrace for myself on a cool winter’s day! Yes! In the middle of the shopping mile at Platia Aristotelous, a palace of Emperor Galerius was uncovered, which can be viewed and discovered from above. The museum shows many of the found relicts and everyday objects from different eras around Thessaloniki. The entrance fee of 4€ is inexpensive. However, the outside collections of steles, sarcophagi and reconstructed everyday situations around the museum building can be viewed free of charge. A MUST for all travellers is a walk through the Ano Polis — the original old town on the mountain slope. After a disastrous fire in 1917, which was ignited by a small spark during cooking, almost half of the former town was destroyed and rebuilt. It is therefore best to inhale the ancient spirit of the city in the preserved old town, Ano Polis. Lazy people (like me) take the bus №50, which leaves every hour at the White Tower and returns after a 50 minute tour. He stops at many sights on his route. A ticket costs 2€, reduced 1€ (December 2017). The highest points are stations 11 to 13 (Trigonia Tower to Vlatadon Monastery). Here you can get out, walk around and enjoy a simple but very tasty ham sandwich for 0,80 € in one of the local bakeries. In the low season you will meet almost only locals around here. 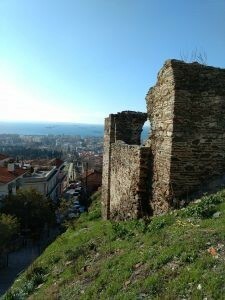 The old Byzantine town wall and the remains of the old castle are very well preserved and the Trigonia tower offers a magnificent view over the town. This view beats the White Tower view! And it comes for free! Here you will also find the most attractive and cheapest souvenir shop in Thessaloniki. Personally, I’m bringing a fridge magnet from every place I’ve been. If you do it that way, you are really well tested in kitsch. So I can say with a clear conscience: here you will find the most tasteful selection of souvenirs. Inside you will find crockery and small decorative objects that are inspired by the Byzantine period. Towels, ashtrays and the usual tourist souvenirs can also be found here, but everything is about half as expensive as in the main streets of the lower part of Thessaloniki. Another MUST is the visit to the Vlatades Monastery. You can find it by following the city wall, away from the tower. 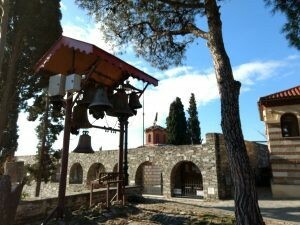 This wonderful, quiet monastery is a place of peace and tranquillity and you can easily imagine yourself back in time. 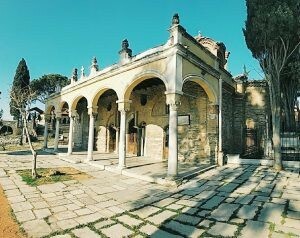 It is one of the few religious communities still active in Thessaloniki and has its own small olive garden. 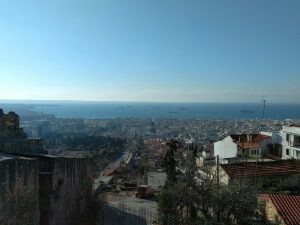 Surrounded by a fantastic view over the sea and the lower Thessaloniki, time has truly stood still here. Wild or semi-wild cats say Hello, some of them are very tame and want to cuddle. 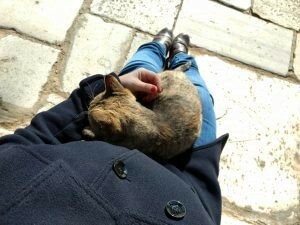 Those who take their time can enjoy sunbathing on the steps of the small chapel with one of these cuddly cats. The chapel, which was the founding building of the entire complex in the 14th century, has become the heart of the monastery. The historic wind is blowing strong up there! If you are satisfied with the old walls of the old town, it is time to start the downhill descent. The roads are sometimes very steep and winding. But the footpaths lead directly down between them and are an interesting glimpse into the everyday world of the Thessaloniken. Small taverns invite you to a stopover or coffee. Get a coffee to take away and sit at the harbor building at the Museum of Photography. There are plenty of seats between olive trees right by the water, where you can enjoy your coffee in peace and relaxation. A Golden Retreiver from other participants quickly made himself at home with me. As a farewell and thanks for my crawling, he left my jacket full of hair. Heh. In Thessaloniki you never know what will happen next! If you want to eat something in addition, you can buy cheap Böreks and other stuffed puff pastry delicacies in one of the many bakeries for about 2 €. They are extremely tasty and affordable. Just for the sake of completeness, I include the (almost) free harbour tour in one of the restored ships. The 30-minute trip is free of charge, but a minimum consumption of a drink is a must (from 5€). It was too touristic for me, but if you want to get a view along the promenade and rest your feet, you can go to the colourful pirate ships at the landing places (for example at the White Tower). Take bus 3 or 8 from the White Tower to IKEA stop, then change to the 172 bus and get off after about 30 minutes. Take a 2h ticket for 2€, because the journey in the local buses takes quite a long time, but you can look out of the window and watch the daily life. The buses are quite noisy, but they have their charm. All this is made up for by the wonderful beach that awaits you. Fine sand, Mediterranean buildings and clear sea. 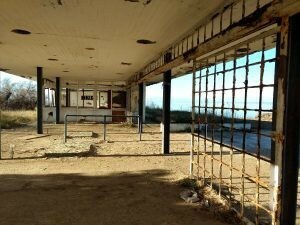 Friends of abandoned buildings will also be able to find here: Why don’t you discover the deserted complex at Oikonomiou or Thermaikos directly on the beach? This hill, which is still being worked on, is perfect for friends of excavations. It is located in the middle of a residential area, but the interesting places are usually covered, so it is not worthwhile to drop in unplanned. However, as a student you can participate in practice excavations.